People who work in creative fields like hand lettering and graphic design are usually creative by nature. But that doesn’t mean that you’ll never need inspiration and help to come up with ideas for projects you’re working on. So, the question is, where are the best places to find some inspiration? Podcasts are great options for resources that can provide creatives with all sorts of ideas and inspiring information for all parts of their businesses. There are podcasts about just about any subject you can think of and that includes all things creative. By spending a little time each week listening to some good podcasts, you can improve your skills, get tons of great ideas, and find ways to increase your business and be more efficient. If you have a creative based business and you want to learn more about some of the best podcasts for creatives, then keep reading below. 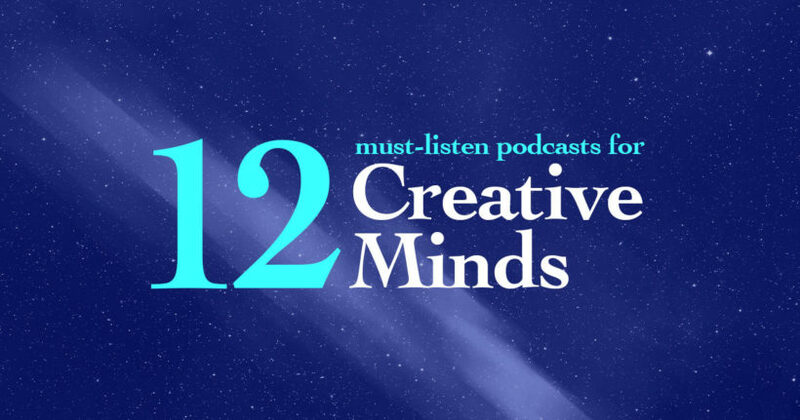 We’ve done the research for you to find the top 12 podcasts for creatives on the web. Perspective Podcast for creatives has a plethora of information about the actual craft of drawing and illustration. This podcast is hosted by Scotty Russell, a creative and all-round good guy who’s been working at his skills for over 25 years. He shares important lessons he’s learned in all of that time, gives tips on what tools are good for what types of activities, and wisdom he has accumulated throughout his life. This is a great resource for those who are looking for ways to improve upon their craft. This podcast is a collaborative show that was born out of the idea that “two heads are better than one,” or in this case, four heads are better than one. There are four top designers that run this show including Tom Ross from Design Cuts along with experienced designers Ian Barnard, Lisa Glanz and Dustin Lee, and they talk about tips that will help other designers and creatives with their crafts. They also talk a lot about the underbelly of the business so that you can learn about how others have overcome some of the hurdles that creatives come upon in their business endeavours. It’s a fun and personable podcast that will help you with the entirety of your design business. Diane Gibbs started this podcast because she wanted something that would help creatives to recharge by being able to hear from other artists about their successes and their struggles in trying to build a creative business. She is a designer, but her podcast is targeted at all kinds of creatives, not just those in the design business. She couples her podcasts with other resources as well, such as worksheets, downloadable PDFs, online conferences, mastermind groups, and even in-person retreats. Drunk on Lettering is a podcast where the two hosts, Roxy Prima and Phoebe Cornog, have some fun and a few drinks together and talk to different experts in the world of lettering. They talk about different aspects of the craft but all while having fun with their guest also. You’ll get some really great ideas for your work, tips about how to be better at lettering, and find out how other successful letterers grew their businesses into lucrative careers. Creative Pep Talk is hosted by Andy J. Miller. He is a creative that started this podcast so he could help others like himself take their art skills and turn them into a business that they can actually making a living from. His passion is for teaching other creatives about where the balance is when it comes to the art and the business. He shares with listeners from his own personal experiences as a creative and sometimes has guests who are different kinds of artists that share what they have learned also. It’s an upbeat, fun, but very informative podcast that all kinds of creatives will benefit from. This podcast features a different artist or creative on each episode that discusses with the audience things like what made them want to go into a creative field. They talk about how they became the type of creative entrepreneur they are and what kinds of things you’ll need to consider before you can grow your business. They share their struggles and how to overcome those so that all kinds of other creatives can learn from the mistakes that they made when they were trying to establish their businesses. Feasting on Design even includes career fields like bartenders and chefs. Any person in an occupation that could be touched by design can find some benefit from this podcast. Mark Hirons started the Creative Waffle podcast so that he could help creatives around the world to continue to learn and share advice on how to go about creating their own niches in the design world. He interviews some of the best artists and designers in the world so that listeners can hear what advice they have and what others have experienced as they made their way into the industry. Mof1, or Master of One, is a podcast that has three hosts from different genres of creative skills that share the latest and greatest from their respective subject matters. There’s Patrick who covers tv and film, Luke who covers toys and games, and Andrew who covers art and design. They let listeners in on what new things are coming soon and what gadgets and gizmos will be worth their hard-earned money. They also feature experts from each field they cover once a week during the show who share tips and knowledge with listeners that will benefit them in their business endeavours as creatives. This podcast is big on inspiration. The creative industry is not one of the easiest to navigate through and be successful at making a living doing what you love. This podcast features guests who have become largely successful by doing the creative skills that they love. Guests share their stories for how they became so successful at what they’re doing and how they used their passions to get where they are. This podcast features two hosts, Sean McCabe and Ben Toalson, who discuss the different aspects of how to turn your creativity into a thriving online business. This podcast really focuses on what you need to know to create the business that will put your creative skills to good use in a lucrative way. They talk about everything from products to marketing and professionalism so that you know what to expect if you want to be successful with making a living out of your creativity. Pat Flynn hosts this podcast to really discuss how you build a business at all. He talks about all sides of the subject like marketing strategies, financial planning, and building clientele. He conducts interviews every week with people who have built their businesses from the ground up and has them share any advice they have and tell their stories of how they found the success they have. Financials is a huge part of building a business and this podcast will give you some good information on what you need to know about your finances to be able to make a living doing what you love. Marketing School is hosted by Neil Patel and Eric Siu. These two share tons of information to help entrepreneurs know how to successfully market their businesses in today’s online world. They also discuss how to find investors for your business so that you can raise money to grow your company. It takes money to make money, so they teach listeners the ins and outs of how to attract investors. This podcast is all about learning for anyone who wants to build a successful business. It’s a valuable resource for hand letterers and graphic designers who are great at their craft but want to learn more about the online business side of things. So, here’s what you should take from this post. As a creative, you have an amazing skill set that have crafted into something that could possibly make you some decent money. But growing a business isn’t the easiest thing to do if you don’t have the information you need to make it work for you. Not only that, but just because you’re good at something doesn’t necessarily mean you couldn’t be even better at it. There’s pretty much always more you could know about any subject, even if you are really very familiar with the subject. Podcasts are usually run by people who have spent a lot of time doing whatever it is they’re talking about on the show. That means they have a lot of experience to pull from and can share what they’ve learned along the way. Plus, they bring on other guests that share what they know too. Share the love – Pin it! We learn through experience, sometimes our own, and sometimes through others’ experiences. Podcasts are out there for you to learn from and if you check out and listen to some of these top 12 podcasts that we have found to be good resources for creatives, we really think you’ll find many benefits that will help you become better at your creative skill set and grow your creative business into a very successful and lucrative career.